The Twelve (or So) Tribes of Israel | Is That in the Bible? The identity of Israel in the Bible is closely linked to the notion that the ancient nation was an alliance of twelve distinct tribes, each with its own territory. Reading the Old Testament in its canonical order, we encounter tales about Jacob the patriarch and his twelve sons who all moved to Egypt. Their descendants are depicted as remaining divided into distinct clans, which would later journey to Palestine, carve up the land, and then conquer their allotted portions. History is not so simple, however, and neither are the traditions we find in the Bible itself. Not all biblical authors were aware of this storybook picture of Israel’s tribes, and many of the text’s later claims are rooted as much — or more so — in theology and politics as in history. Themes that have captured the imagination of exegetes for millennia, like the myth of the “lost tribes of Israel”, take on new significance when examined closely. It should be obvious to anyone who has spent time thinking about it that tribes and countries are not actually founded by people of the same name. Stories about legendary founders and their genealogies serve to explain the storyteller’s present-day reality — who their allies and enemies are; why in one place they herd sheep, while in another they work metal; and so on. Often an ancestor originates as an unrelated folktale hero, and that character comes to symbolize an entire tribe or nation through a complex process of oral and literary development. 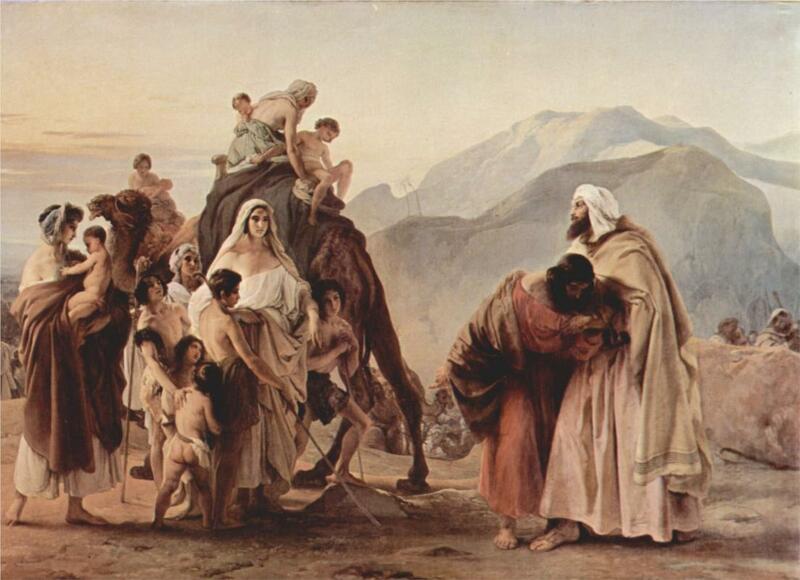 The stories of Jacob and his children, then, are not accounts of historical Bronze Age people. Rather, they tell us how much later Jews and Israelites understood themselves, their origins, and their relationship to the land, within the context of folktales that had evolved over time. The stories of Jacob and Esau, for example, illustrate the stormy relationship between Israel and Edom, its southern neighbour. The story about Jacob and his father-in-law Laban the Aramean in Genesis 31:51–54 serves to establish territorial boundaries between Israel and Aram (Syria). Jacob’s twelve sons provide a legendary basis for the twelve tribes of Israel and a framework for genealogies and folktales related to those tribes. One need look no further than the names themselves to see that most of them are not personal names, but the names of ethnic groups, geographical regions, and local deities. E.g. Benjamin, meaning “son of the south” (the location of its territory relative to Samaria), or Asher, a Phoenician territory whose name may be an allusion to the goddess Asherah. The number twelve had great significance for the biblical authors and Israel, particularly within the religious sphere. The high priest had twelve gems inlaid in his pectoral. The Tabernacle bread consisted of twelve loaves (Lev 24:5). Offerings were to brought on twelve oxen (Num 7:3). Cultic vessels were numbered in twelves (Num 7:84). The bronze sea in the temple was supported by twelve oxen (1 Kings 7:34). Solomon had twelve officials who were responsible for supplying the royal household from their respective districts on a rotating monthly basis (1 Kings 4). The steps in front of Solomon’s throne featured twelve lions (1 Kings 10:20). Ezekiel envisioned an altar hearth twelve cubits square (Ez 43:16). And so on. The artificial nature of the association between the Israelite tribes and the number twelve is often evident in the text. The biblical authors want there to be twelve tribes and twelve tribal territories; but since the Levites are not allotted their own territory, the tribe of Joseph is duplicated, resulting in the tribes of Ephraim and Manasseh. (The text explains this in etiological terms by making Ephraim and Manasseh the names of Joseph’s sons.) So already, we are stuck with thirteen tribes in practical terms. Furthermore, when we look at the various passages that enumerate the Israelite tribes — particularly those predating the canonical Pentateuch — we find surprising variation in the names and numbers of the tribes. Examination of the territories held by the tribes provides more surprises and enigmas. It soon becomes apparent that the tidy image of twelve tribes and twelve patriarchs was a late imposition on more diverse traditions. The Song of Deborah in Judges 5, often considered the oldest text in the Old Testament, lists ten tribes: Ephraim, Benjamin, Machir, Zebulun, Issachar, Reuben, Gilead, Dan, Asher, and Naphtali. Two of those — Machir and Gilead — are not among the usual twelve, though they do appear in other texts as clans, territories, or ancestors. into the valley they rushed out at his heels. and Dan, why did he abide with the ships? settling down by his landings. Naphtali too, on the heights of the field. Four of the tribes already appear to be marginal — Asher, Dan, Reuben, and Gilead — as they are the most geographically remote of those listed and choose not to join the battle. It is remarkable that Mannaseh and Judah, which occupy the largest territories in other texts, are not even mentioned. It is likely that there was no Judah at this point. Other tribes not mentioned are Gad, Simeon and Levi. Judges 1 describes the conquest of Canaan by the various tribes. Here, again, many are missing; only eight or ten (depending on how you count them) appear in this early passage. Benjamin and Simeon are mentioned only in the section describing Judah’s exploits, and they function as part of Judah along with the Calebites and the Kenites. The other seven tribes whose conquests (or attempted conquests) are described include Joseph, Ephraim and Manasseh as separate tribes, as well as Zebulun, Asher, Naphtali, and Dan. The tribes of Issachar, Reuben and Gad are not mentioned. In Joshua 13–19, another early text (but probably later than Judges 1), we have another description of Canaan being divided among the tribes. Simeon, again, appears not to be a full-fledged tribe; it is entirely contained within Judah’s territory. Garbini suggests that Simeon had already disappeared as a tribe by the time Judah came into being and these texts were written. There are other oddities with these chapters in Joshua. For example, Joseph is again mentioned separately from Ephraim and Manasseh, demonstrating the artificiality of the Pentateuch’s twelve-tribe foundation legend. There is confusion about what happens with Gilead (here a territory rather than a tribe) in Joshua 13. Half is given to Manasseh, but all of it to Gad. Perhaps an older text has been rewritten with later tribal traditions, leaving telltale signs of imperfect editing. Caleb is again given a separate allotment from the other tribes. One gets the impression that Caleb was as much an independent tribes as the canonical twelve tribes in these early texts. In the tribal genealogies of 1 Chronicles 4–8, we get Manasseh mentioned twice and Ephraim (but not Manasseh) equated with Joseph, while Dan and Zebulun are missing. The list of tribal leaders in 1 Chronicles 27 also lists Manasseh twice but fails to mention Asher or Gad. It also lists Aaron as a tribe (more on that below). Deuteronomy 33 features a passage in which Moses blesses all the tribes. Did I say all of them? Poor old Simeon is missing again, and the obscure Issachar is treated as another name for Zebulun without a blessing of its own. Variation in tribal lists continues right into the Christian era. Revelation 7 speaks of twelve thousand servants of God from each tribe of Israel, sealed for the final days. The tribes listed here include Joseph and Manasseh separately, but no Ephraim and no Dan. Again, selective editing has been needed in order to maintain the magic number twelve. Geographically, the division doesn’t make sense either. Simeon and Reuben are south and east of Judah, and could not have been part of a “northern” kingdom. In terms of archaeological and epigraphic evidence, the other Transjordan tribes (Gad/Gilead and Manasseh) have little connection with Samaria, and some of the northern tribes — Dan, Naphtali, and Asher — might never actually have been part of Israel. Inscriptions found in that region are in Phoenician, not Hebrew. In an earlier passage, 2 Samuel 2:8–10, David is made king of the house of Judah, while Ishbaal is made is made king over “all Israel”, which is described as consisting of Gilead, the Ashurites, Jezreel, Ephraim, and Benjamin. Levites: A Tribe or a Trade? There are reasons to think that “Levite” originally designated a member of a cultic profession rather than a clan or tribe member. For one thing, the name itself may mean “a person pledged for a debt or vow” (i.e. to a deity).³ In Judges 17:7, we have a Levite who is clearly said to be of the tribe of Judah, and his professional skills as a Levite priest are a focus of the story.⁴ In Exodus 4:14, Yahweh speaking to Moses calls his brother “Aaron the Levite”—an appellation that only makes sense if Levite is to be equated with a priestly caste or group rather than an ethnic group. Under this reasoning, we can assume that the idea of Levites being a tribe was a later innovation. Furthermore, we see evidence in the biblical texts of rival priestly groups vying for control of the temple and other religious positions: Zadokites, Aaronites, Mushites, Korahites, Merarites, and others. 1 Chronicles 12 and 27 list Aaron and Zadok alongside the other tribes, implying some kind of independent relationship. In exilic and post-exilic times, Zadokites were clearly distinct from the Levites; the former were allowed to serve as altar priests, while the latter were relegated to lesser functions, a division made clear in Ezekiel. The genealogies portraying the Zadokites as descended from Aaron and Levi are generally agreed to be a fiction to provide them with an appropriate ancient lineage.⁵ Levites are frequently mentioned as a group distinct from the temple priests and other functionaries in Ezra-Nehemiah and other texts. The evolution of, and rivalry between, various priestly groups and temple functionaries is a complicated subject, but the simplistic notion of a monolithic priestly tribe called Levi does not seem to fit the evidence. The Northern Tribes of Israel: Lost or Just Misplaced? Many scholars see an anti-Samaritan bias that has contributed to the view of the northern tribes as “lost” and of no relation to the later inhabitants of northern Israel.⁷ The Masoretic text of 2 Kings 17 describes Samaria being repopulated with colonists who worshipped their own gods and abandoned Yahweh.⁸ A separate account of Samaria’s destruction in 2 Kings 18 mentions no colonists and implies that the entire population was carried off. In fact, however, we know from Assyrian sources that only a portion of the population was deported.⁹ Those who remained continued to venerate Yahweh and established a thriving temple at Mt. Gerizim that rivalled the Jerusalem temple. The Samaritans and their religious practices survive to this day in Israel. The romanticized lost tribes have exerted a surprising influence on Christianity as well. A number of British sects, for example, have held that the British people were descendants of the lost tribes; this theology (called British Israelism) was one of the pillars of the Worldwide Church of God founded by Herbert Armstrong and is still taught in some churches. Various Bene Israel movements in other parts of the world have also sought to identify local communities with the lost tribes. The restoration of the lost tribes is one of the Mormon articles of faith. The myth of the twelve tribes of Israel is another example of how the Bible in its present form presents an idealized vision of the past based on religious and nationalistic concerns, developed through numeric symbolism, fictional genealogies, and etiological tales. Careful reading can reveal many of the underlying traditions that preceded the text’s final form. There is always more than meets the eye. Click the image below for a handy chart I made showing which tribes appear in the Bible’s various tribal enumerations. ¹ John Van Seters, Prologue to History: The Yahwist as Historian in Genesis, p. 208. ² Giovanni Garbini, History and Ideology in Ancient Israel, p. 123. ³ Merlin D. Rehm, “Levites and Priests,” ABD. ⁴ Webb, Book of the Judges, p. 201. ⁵ George W. Ramsey, “Zadok”, ABD. ⁷ Thomas L. Thompson, “Your Mother was a Hittite and Your Father an Amorite: Ethnicity, Judaism and Palestine’s Cultural Heritage”, Scandinavian Journal of the Old Testament, 27:1, 76-95. ⁸ The text is hard to follow, however, and the Septuagint appears to contradict it, stating that the people in Samaria did remain faithful to Yahweh. Furthermore, the Septuagint is thought to reflect an older Hebrew version. ⁹ Etienne Nodet, “Israelites, Samaritans, Temples, Jews”, Samaria, Samarians, Samaritans (Studia Judaica 66 / Studia Samaritana 6) p. 159. What’s the Deal with Matthew’s Genealogy? Armstrong made claims that god “restored” the truth about Israel through him in the end times. On BI, he actually stole his revelation from the non-deity, J.H. Allen (“Judah’s Sceptre). He finds it likely that early Israel (the one mentioned on the Victory Stele of Merneptah) was made up of a tribe of Joseph, based around Mt. Ephraim and Shechem, along with tribes of Machir and Gilead, and of course the “Benjamin” (southern ones) in the area north of Jerusalem. Other tribal definitions were later additions, e.g., “A judicious reading of both the archaeological and the textual record militates in favor of… the early monarchic period for the addition of the four Galilean tribes.” He even speculates that the tribe of Dan may have originated as the unrelated Danune known among the Sea Peoples that gave Egypt so much trouble in the 12th century BCE, though he reserves judgment on that point. @M.K. : Very interesting! I always enjoy finding out where “divine inspiration” actually comes from in these sectarian movements. @Quadell: Thanks for the informative comment. That sounds like a book I need to read. Are you familiar with the view of Richard Elliott Friedman and other scholars that the Exodus involved only the tribe of Levi? According to this hypothesis, the Levites brought Yahweh worship with them to Canaan, where El was the chief deity of the West Semitic pantheon. Rather than worship El and Yahweh, or to say that Yahweh was El’s son, the decision was made to say that Yahweh and El were the same all along–see the famous Exodus 6:2-3. Commending this theory: many Levites have Egyptian names–Moses, Phinehas, Hophni, Hur, etc.–and the Levites, a tribe associated with violence in the Torah (Genesis 4:5-7; Genesis 34:25 ff; Exodus 32:28-29; Deut. 33:11), have no land rights in Canaan, possibly indicating that they forced their way in and were awarded the role of priests. Friedman also points out that the ancient Song of Deborah does not mention the Levites (as you note above), while the Song of the Sea/Song of Miriam (Exodus 15:1-18) doesn’t mention all Israel–only a people whom God leads to his miqedash, his sacred abode. This theory also neatly explains why P and E, both Levites, contend that the name Yahweh wasn’t always known (since the Levites introduced him to Israel), while J, a non-Levite, assumed that the name was used from the beginning, starting with Eve’s exclamation (Genesis 4:1). I’m not too familiar with Friedman’s views specifically, but I think the Kenite Hypothesis is largely correct — that the Kenites, Midianites, and other tribes from around that region introduced Yahweh worship to Judah. I believe the oldest inscription mentioning Yahweh is an Egyptian one that speaks of the “Shasu (tribe) of Yhw”. I think there are also older scholarly views associating the Levites with the Nehushtan, the bronze serpent that may have been of Egyptian origin. I need to read up on this stuff more. I used to read “The Plain Truth” regularly; it was stocked in most of your full-service barbershops. The Worldwide Church of God posited more than just British Israelism. Britain was the home of the descendants of Manasseh, but the favored son of Joseph, Ephraim, counted the Americans as his descendants. When asked how this could be considering that the USA is an ethnic hodgepodge, Rev. Armstrong countered that immigration is difficult and only someone with the blood of Ephraim could accomplish it, so that despite our ethnic diversity, we must all be Ephraimites! I get my hair cut in a salon now, so I’m now reading “Vogue,” but after Armstrong’s death, the WCG slowly began dissociating itself from his more maverick views, now calling itself Grace Communion International. Interesting. Thanks for the insight into the WCG and their weird Israelite Origins doctrines. An interesting point about Ishbaal/Ishbosheth is that he’s said to have reigned for two years (2 Samuel 2:10), and after his murder (2 Samuel 4:6f), “all the tribes of Israel” asked David to be king over them (2 Samuel 5:1f). However, David is said to have ruled over Judah for “seven years and six months” at Hebron (2 Samuel 2:11, 5:5) before ruling over the united kingdom of Israel and Judah from Jerusalem for 33 more years (2 Samuel 5:5), so how could Ishbaal/Ishbosheth have ruled Israel for just two years? Do you know which recension or edition of the LXX says that the people remained faithful to Yahweh? Reading the one found at http://ccat.sas.upenn.edu/nets/edition/12-4reigns-nets.pdf it seems that they didn’t worship Yahweh. They were fearing the Lord and serving their own gods according to the judgment of the nations, there where he had exiled them. To this day they were acting according to their judgment. They fear, and they act according to their statutes and according to their judgment and according to the law and according to the commandment that the Lord commanded the sons of Iakob, him whose name he made Israel. Deux passages classiques font des Samaritains soit de faux Israélites pratiquant un culte syncrétique, soit des Juifs abâtardis : d’une part, selon 2 R 17,28-40 TM, les colons amenés après la déportation de Samarie en -721 pratiquent «jusqu’à ce jour» un mélange de leurs cultes d’origine et de yahwisme. D’autre part, Josèphe rapporte (AJ 11:302-345) qu’à la fin de l’époque perse tous ceux qui ont épousé des Samaritaines sont expulsés et accueillis par Sânballat, gouverneur de Samarie, puis celui-ci obtient d’Alexandre, qui assiège Tyr (-332), de construire un temple au Garizim; s’y réfugient ensuite les « apostats de la nation juive ». Tout cela est extrêmement judéen. À propos des colons assyriens, la LXX dit au contraire que «jusqu’à ce jour ils révèrent Yhwh» et sont fidèles aux commandements prescrits aux fils de Jacob «à qui il avait imposé le nom d’Israël». Il y a une légère ambiguïté sur ces «fidèles» : ils peuvent être les descendants soit des colons, soit d’un reste d’anciens Israélites. Josèphe, qui paraphrase le passage d’après une source hébraïque peu différente du TM, confirme la lecture LXX, car il parle de la fidélité yahwiste «jusqu’à ce jour» des anciens colons (AJ 9:288-291). Ici comme ailleurs, il suit l’incohérence de ses sources.